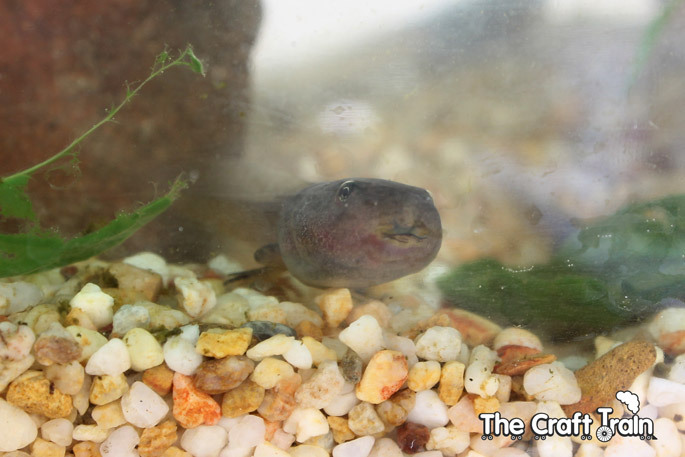 Everybody knows that tadpoles hatch from tiny eggs and then gradually change into jumping amphibians with lungs and four legs, but knowing this and actually seeing it happen are two completely different things. As our macro photos will testify the changes and different stages they go through are completely fascinating to watch – and not just for kids! It’s possible to set this activity up for next to no cost. I know this because when I was about the same age as my own kids (albeit with a little more freedom) my sister and I used to walk down a bush track near our house, ice cream containers in hand, and scoop little taddies from the creek to keep as pets. We filled our containers half-full with creek water and added a large rock for the ones which made it all the way to becoming frogs. I clearly remember how excited we got to see them growing legs, and if you had a little froglet in your container all of the neighbourhood kids would want to come over to see it. When this happened I felt like a hero! 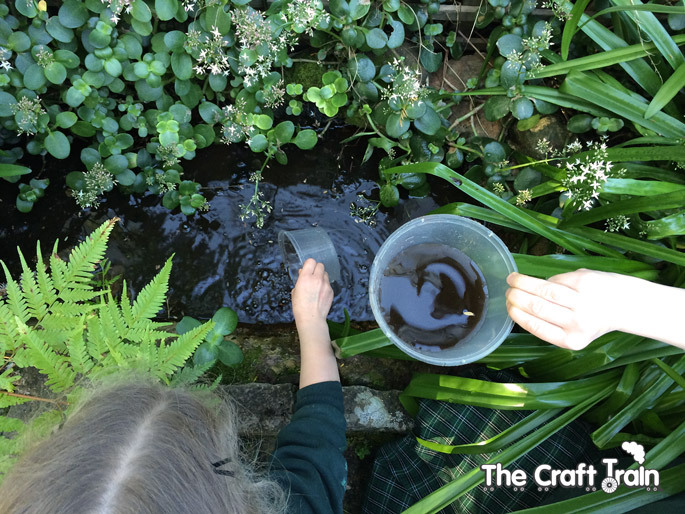 I wanted my own girls to experience the magic of watching this transformation happen with their own eyes, but unfortunately I can’t bring myself to allow them traipse off into the bush on their own to catch tadpoles. Luckily I don’t need to though because we have a small pond in our back yard that the local frogs love to visit to lay their eggs in. We hear the frogs more than see them because they are very clever at comouflage and hiding, but we have been lucky to spot them a few times. If you’ve never seen frog eggs they look a lot like caviar and float like bubbles on top of the water. 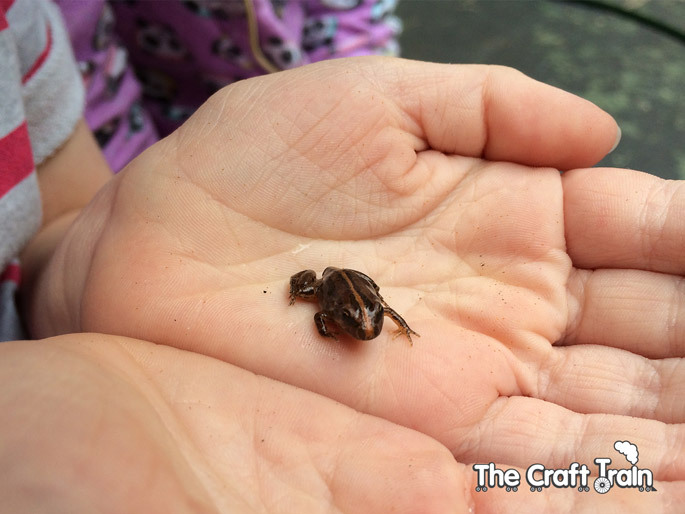 Every so often we find a batch of them floating on the surface of our pond, but at the time of this project there were none so we caught a few baby tadpoles instead. 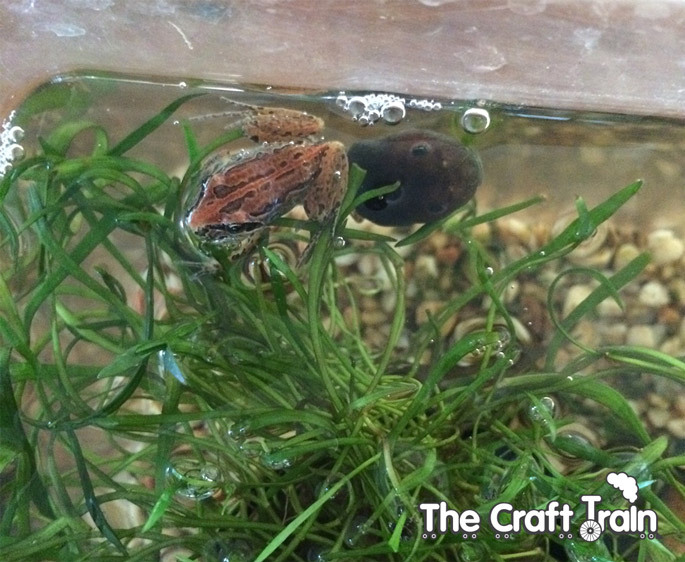 A small water plant – we bought this on recommendation from the pet shop lady, and the frogs really seemed to love it. In addition to keeping their water healthy the plant also gives them a place to hide and lightly sit on once they have developed their lungs and need air to breathe. Some water conditioner to make the tap water safe for them to swim in (the same as what you would use for regular goldfish) – I have also read that you can put a bucket of water outside to sit for a couple of days and it will do the same job but we were too impatient for that! 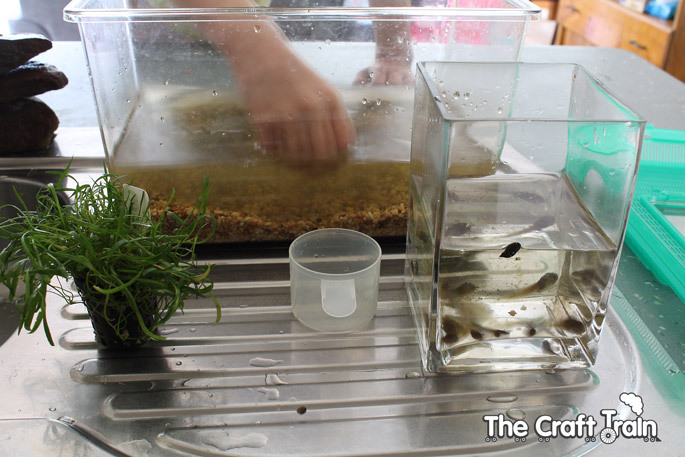 Once we had the tank set up and ready to go the girls caught some tadpoles by scooping them up in plastic containers. They were so little at first, they must have been not long hatched out of their eggs. 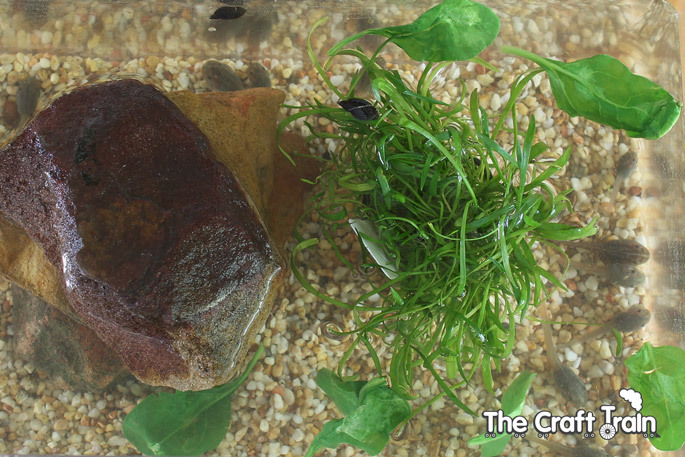 As you can see we half-filled the tank and left some rocks and plant growth poking up from the top of the water. 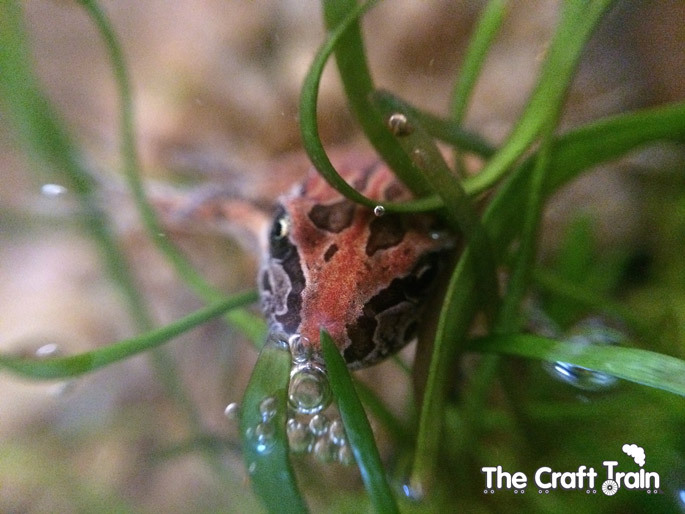 Once the tadpoles turn into froglets this is essential for their survival, but as young tadpoles they only need water and somewhere to hide. The large rocks we added came from the garden. Tadpoles are herbivores, so while they were small we fed them baby spinach leaves which had been rinsed and then microwaved on high for 20 seconds. Around three leaves was enough to last them for a few days, and once they had all been eaten we added some more. When they grew bigger they ate more and needed more regular feeding. 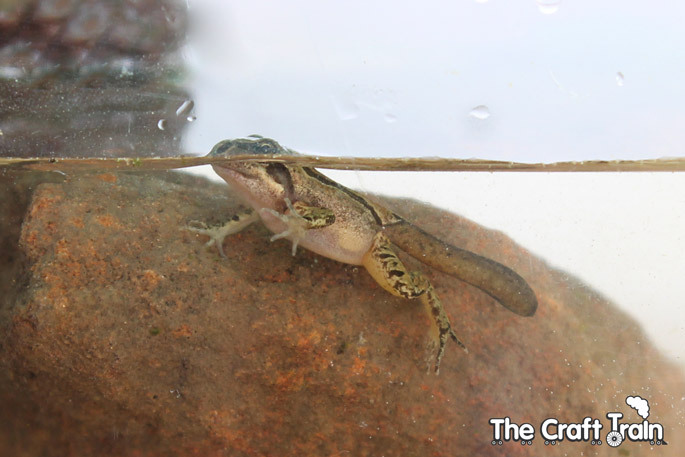 When tadpoles become froglets they turn into carnivores, so they begin to rely on insects as their main source of food. 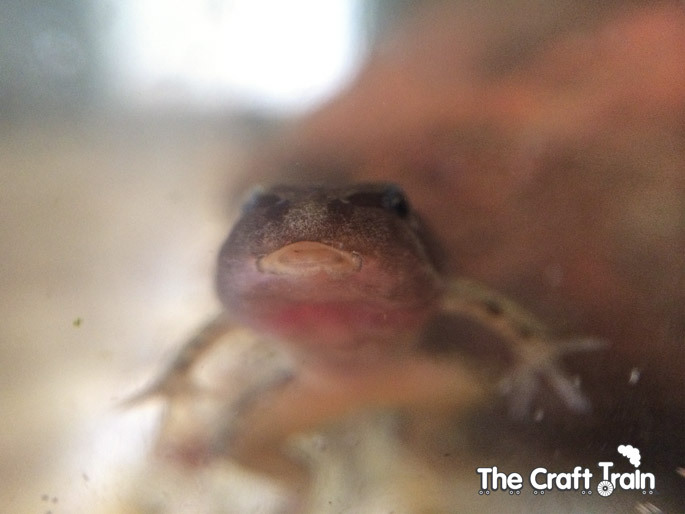 Once our babies started looking more like frogs and less like tadpoles I began to add a scoop of living mosquito larvae from the surface of our pond into their tank as well as the baby spinach leaves. I’m not a hundred percent sure if they ate the larvae or not because it took a long time to disappear, but it still appeared to get eaten after a week or so of floating on the surface (either that or they turnied into mozzies and flew off into our house). At first the tank stayed clean for a long time and only needed scrubbing out every few weeks, but as the tadpoles grew bigger it got dirty quicker and this became a weekly task. In order to clean the tank the girls helped me catch the tadpoles and place them in a container filled with a scoop of their tank water before completely emptying and scrubbing the dirty tank out. 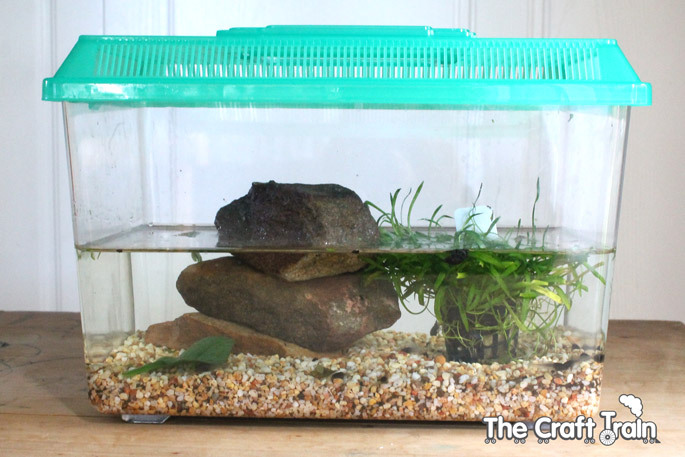 We added fresh tap water and more water conditioner before putting the tadpoles back into their home again. It was truly interesting to observe and photograph the metamorphosis of these creatures. Their skin was quite translucent which I had never realised before, so when we could see their tummies we could observe their intestines too! 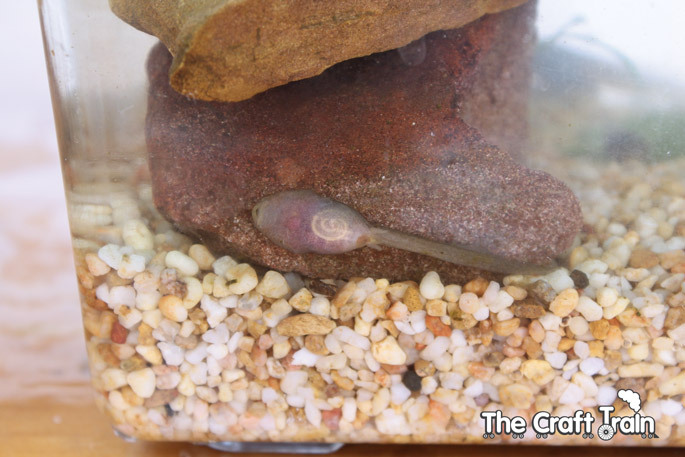 Notice how cleverly the tadpole camouflages himself to the pink sandstone rock in the image above. Some of these photographs have been taken using my DSLR and some are iphone snaps using an olloclip to get up close (a clip on macro lens). 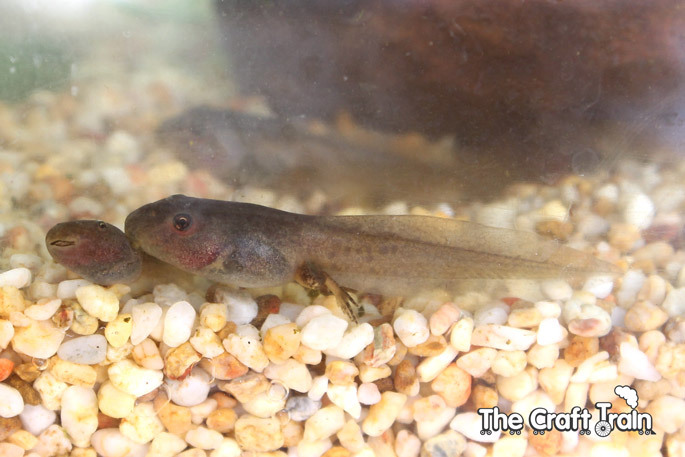 Our tadpoles were all different sizes when we caught them so they were at different stages of development throughout the time that we were observing them. In total we had them in our house for around three months. Once our tadpoles lost their tail completely we released them back into our pond. This was something the girls really loved doing! Seriously, how cute are they! 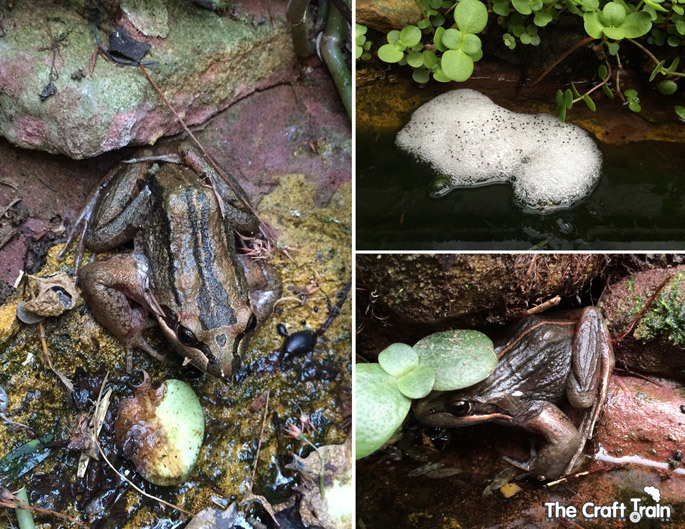 Just in case you’re wondering, the frogs that we have been observing are striped marsh frogs which are common along the eastern coast of Australia and often found in suburban areas. 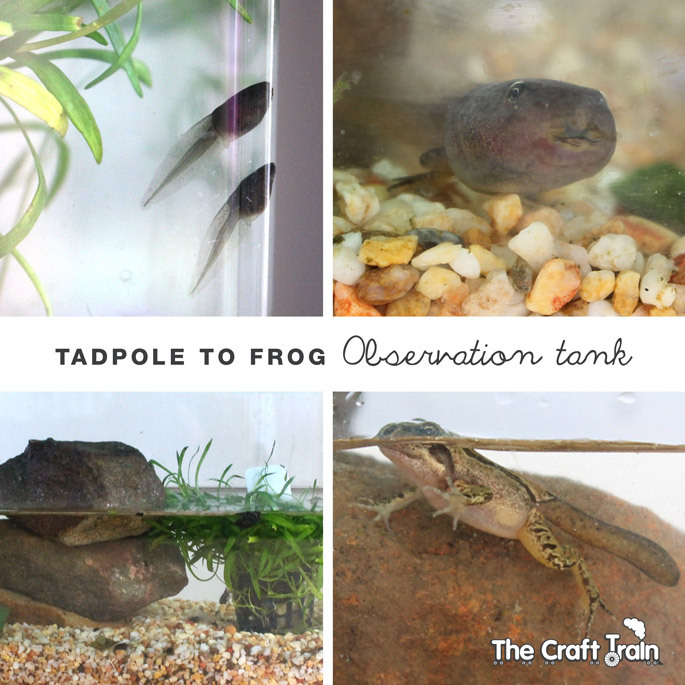 I’m not an animal expert at all so any questions I had whilst raising the tadpoles I directed straight to my blogging buddy Penny from Mother Natured (thanks again Penny for letting me treat you like a free online veterinary consultant). She has done this activity with her own kids and given away some of her valuable tips and knowledge here. 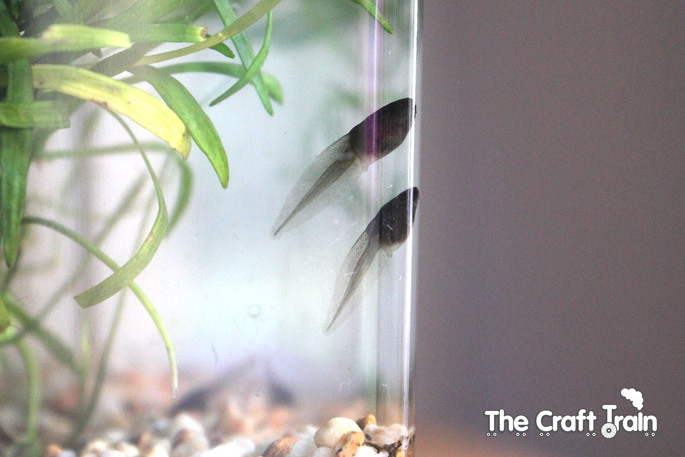 Have you kept tadpoles for observation before? Trust me, they’re more interesting to watch than TV – and I think even the kids will agree with that! You can find lots more fun and interesting activities for kids on our nature crafts and science fun for kids boards on Pinterest. Or is it better to just keep in the water all the time thank you! Hi, I really don’t know about that particular breed of frogs. 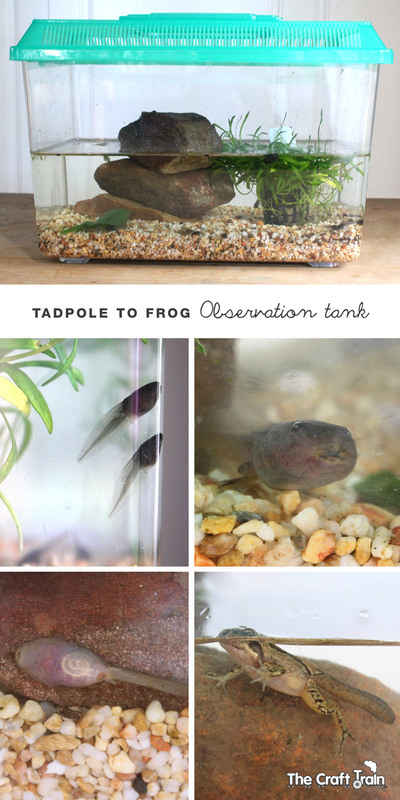 As I mentioned in the post I am not an animal expert just a mum who wanted her kids to see frogs develop from tadpoles in a tank. Based on my limited experience and the breed of frogs we observed, they love to have rocks both as somewhere to hide as well as something to sit on to breathe air. Hi there. 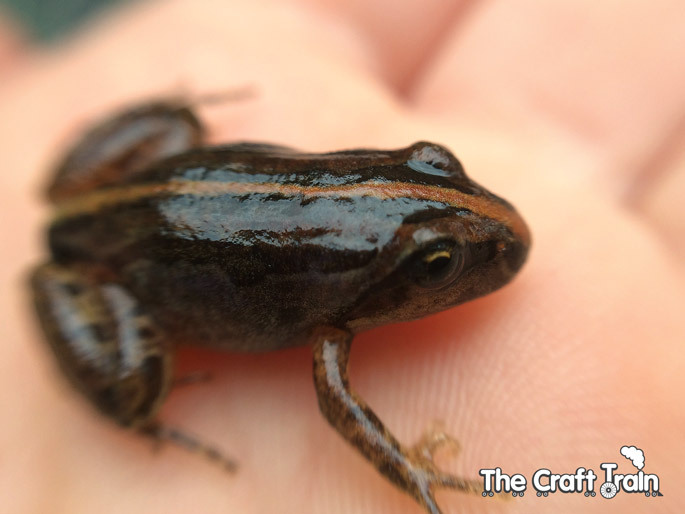 Thanks for the info, I don’t pretend to be an expert on frogs – I’m not. 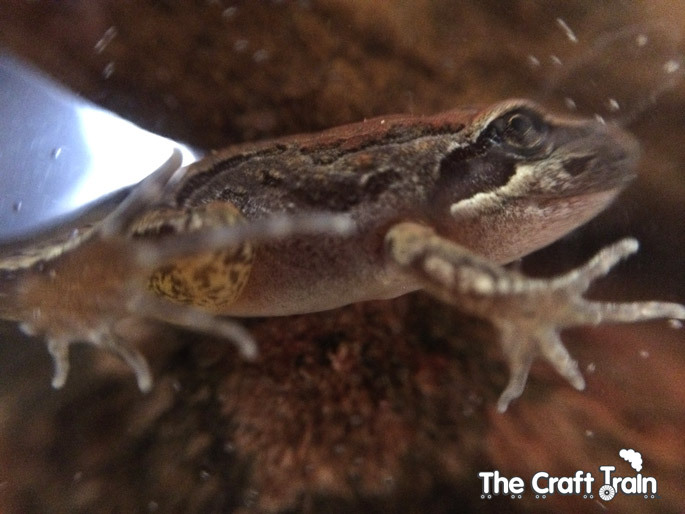 With this project I was merely encouraging my girls to appreciate frogs and learn more about their transformation by observation. 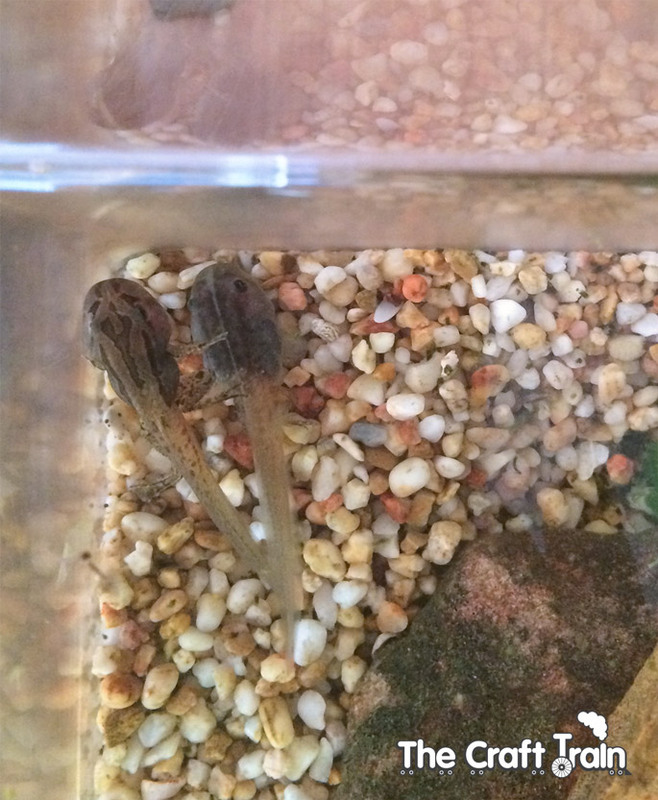 In answer to the species question, I learned that these frogs were striped marsh frogs by looking them up and finding images on Wikipedia which look exactly like the ones which mature in our backyard pond, which is where we collected the tadpoles (not eggs) from. As soon as they were able to hop we released them back into the pond.